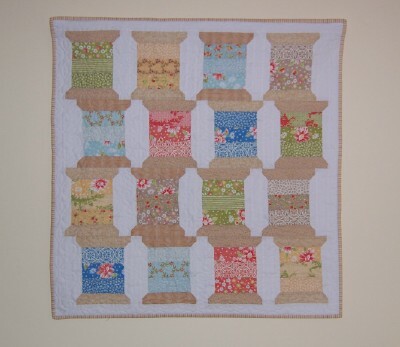 Cupcakes 'n Daisies: Spools-Along Sew-Along Parade . . I just LOVE a parade, all kinds of parades. Last weekend was homecoming weekend where I live which comes with the traditional homecoming parade. What's better than cool weather, bands playing and marching down the middle of the street, kids on the back of flatbed trucks sitting on bales of hay, and football players and cheerleaders throwing candy to the crowd? Today you get our on-line Spools Parade, you'll just have to picture me sitting on the back of a convertible wearing a crown and sash, smiling, and throwing you candy with a big banner that says, "Welcome to our Spools-Along Sew-Along. 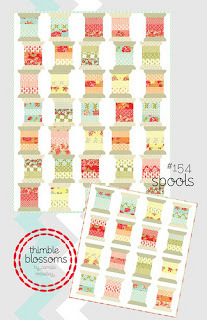 Just in case you were born yesterday, Spools is a pattern by Camille Roskelley for thimble blossoms and is available here. This pattern is for the quilter in all of us! I almost forgot Cindy's quilt! 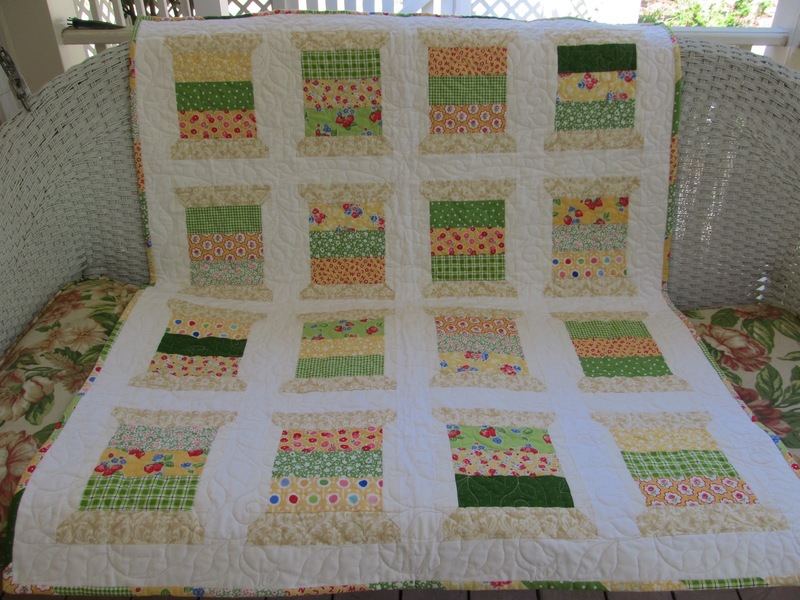 She moves up to the beginning of the parade with this adorable, summery quilt that she just got back from the quilter. The next entry in this parade is mine! My Spools is back from the quilter and hanging in my sewing room! I made a bigger version but it folds perfectly to hang and look like the smaller version! 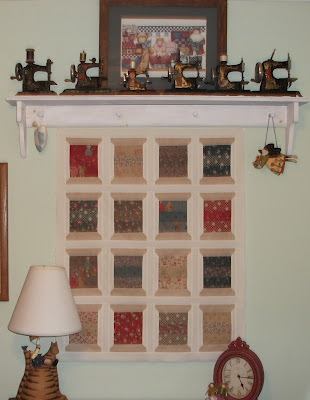 Between my sewing machine cover and now my wall hanging, I sure have jazzed up my sewing room this year. 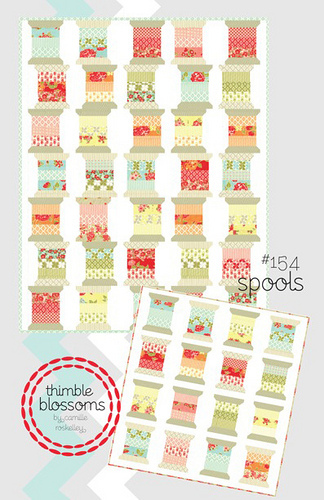 My Spools is made using Marmalade and Bliss by Bonnie and Camille for Moda. 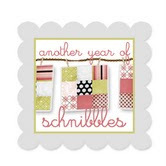 This entry is by Annette at Sunshine Yellow. Annette made this quilt in no time flat using scraps. 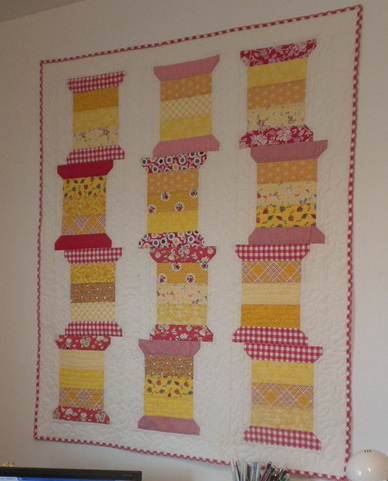 It's quilted and hanging in her yellow and red sewing room, it's as cheerful as Annette is. 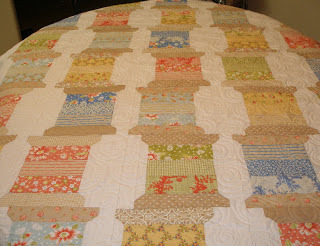 Here's Sherri's quilt from A Quilting Life, her Spools is finished and brightening her sewing room too. The fabric is Marmalade. Sherri says this quilt puts a big smile on her face every time she sees it. Sherri just announced yesterday that she will have a book out in March, her first, I'm guessing that's putting a big smile on her face too. Congratulations Sherri, I could not be happier for you and look forward to hearing more about that book and hope it's the first of many. Next up, from Pink Pin Cushion, is Sinta's Spools made with Hideaway by Lauren and Jessi Jung for Moda. My quilt was already done and at the quilter by the time Sinta finished her version. After seeing hers I wished I had tossed in a checked inner border and lovely outer border, they add so much to this project. The next entry in this parade is by Cathy at Quilting on Main Street. It's hard to tell from this picture, but Cathy made a smaller version of Camille's pattern, this wall hanging is 28" x 30" and was made using one California Girl by Fig Tree charm pack! ONE!! Plus some background fabric and tan for the spool toppers and bottoms. Very clever, and cute! Darlene at Quilting Daze also used some Fig Tree fabric for her Spools, California Girl with some Strawberry Fields. Darlene just finished quilting her project this week. Thanks for getting it done before the parade Darlene! It looks great! The quilting design reminds me of bobbins, all wound up and ready to play with the spools. 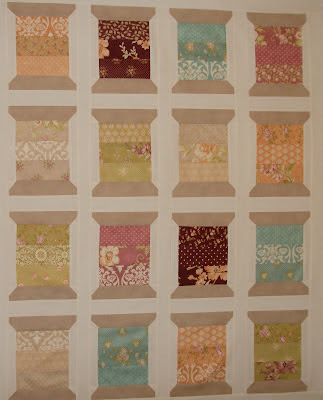 Next we have TWO Spools quilts from Susan at Cozy Little Quilts. This Spools is made from Fig and Plum by Fig Tree. And this one from Petite Odile, by French General for Moda. I love the looks of both of them and wonder how Sue decides which one to hang when. Did you also notice that Sue went with the neat stacked spool blocks for both of her projects? I'm guessing Sue is a very neat and very organized person. And bringing up the rear of the parade is Lisa, Stashmaster, who also joined in the fun with this lovely Spools. 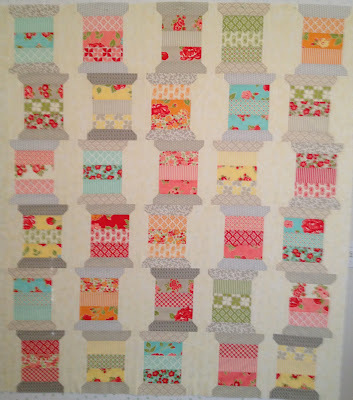 That Marmalade sure makes a pretty quilt top. Nicole, Sister's Choice, has the other half of the parade at her blog, be sure to check it out. A big thanks to everyone who participated in the Spools-Along Sew-Along, sewing is fun, but so much more fun when done with friends. Thanks also to you for following along. Every parade needs an enthusiastic crowd lining the streets, you did good! Fabulous parade! Each and every quilt is stunning! Thank you so much for putting this together for us. 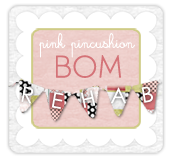 I love your banner...so fresh and colorful with your gorgeous creations! What a fun parade! So lovely to see all the different versions. I loved them all!! This quilt is definitely on MY TO DO LIST!! WOW!! love to your read your blog with my coffee have a great day !!! Thanks for sharing.. I love seeing them all. Guess I better get going on one for me. Fabulous quilts! The yellow and red one is a pleasant surprise! Just evokes a smile! Wonderful to see all the Spool quilts together here! It makes me want to make anther one! Maybe a small one this time! Each one of these quilts are as sweet as can be! Gonna go see Nicole's parade now! They all came out soooo great! Love seeing Sinta's with that gorgeous border, it really makes the spools pop. They all are just so beautiful! Best kind of parade...indoor. All the quilts are wonderful. They are all wonderful. Thank you for the inspiration and motivation. 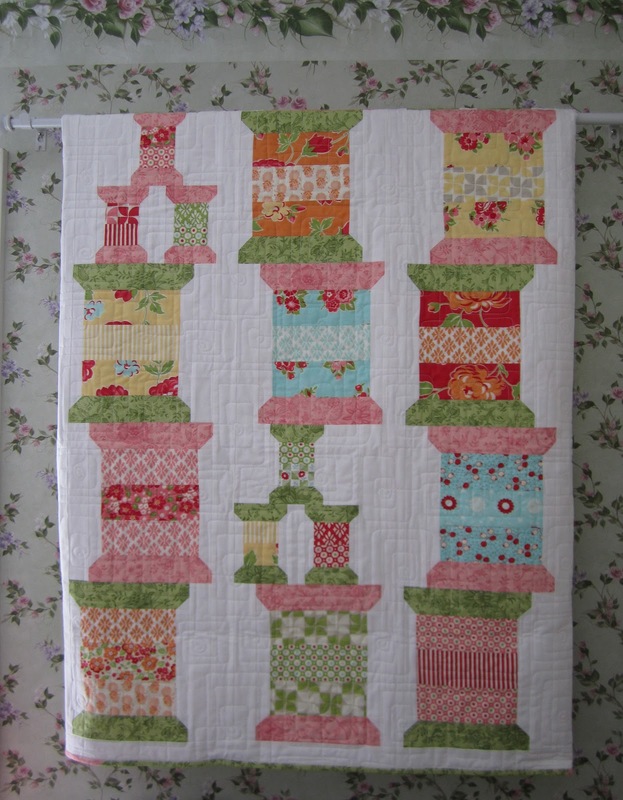 Every time I see pictures of spools quilts, I think of how fun it would be to make one. Now, with this parade, I know I have to do it. These are just wonderful, every one of them! Now to visit Nicole's blog and see the rest. . . Applause for each and every unique and happy spool quilt and the talented quiltmakers!!! Oh my, they are all so adorable!! SO many talented ladies in choosing different fabrics and putting their own little touches to each quilt. Thanks for creating the enthusiasm for this fun project!! I just discovered your blog and have fallen in love with your spool quilt. I was wondering if the little spools you made in your quilt are also in the pattern ?? I think they are adorable !